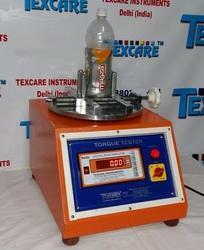 Prominent & Leading Manufacturer from New Delhi, we offer bottle cap torque tester. Bottle Cpa Torque Tester is one of the most efficient and accurate testing instrument that is used in most of the PET industries and bottling plants to test the fastness of the lids and caps of the PET bottles and jars. The instrument is provided with a digital display which allows easy reading of the test results with greater accuracy. Testing the fastness of Caps is essential as If the bottle caps are not fastened properly and firmly, it can be a great issue for the safety of the products inside them. The instrument is designed and manufactured in the compliance with all the international standards. The instrument comes complete with a conformance certificate and user manual for easy operation.